Fortunately, there are still many surviving artists and artisans working and supporting themselves throughout El Salvador. Many began in war-torn communities that suffered the most well-known atrocities, including El Mozote and the repatriated communities from Mesa Grande’s refugee camps, as a way to support and sustain their communities. Depending on the local resources available and the interests of the group, the artisan crafts include fabrics made on looms, indigo and hand or machine-embroidered fabrics, hammocks, jewelry made from local nuts (pacun, tagua, and coconut), black clay items, inlaid wood, and organic fabrics made with natural dyes such as teak or almond leaves. Women artists have formed cooperatives to sustain themselves economically. These groups give them not only financial support, but also provide empowerment, solidarity, community networking, and have allowed them to re-claim their dignity. While working within their home communities, they take turns watching each others’ children, talk about social issues, and discuss how to promote their merchandise. Besides obtaining the basic resources of life – food and shelter, health care, and education for their families – they have re-gained their sense of purpose and hope. Their products are considered high quality; many are sold at fair trade prices and within sweat-free environments. Productivity is greater when the workers are producing for themselves. It is a win-win situation for the worker as well as the consumer. The hand-embroidered linen products of El Salvador are easy to identify anywhere in the world as Salvadoran and are one of my personal favorite artisan crafts. If you are unfamiliar with them, I’ll try to describe them. Typically (but not always) you will find a white background such as a dress, apron, tablecloth, set of napkins, table runner, or handbag. On it are stitched small, embroidered items using brightly colored wool yarn. Typical patterns would include items with a nature theme such as hens and roosters, trees and flowers, cornstalks, animals, sunshine, perhaps a house and people such as a woman carrying items on her head. It is impossible to look at these pieces without smiling. They are the most cheerful items and brighten any dismal day. It is a joy to give or receive such a piece. In some locations that sell these items, there is a tag attached that provides extensive information. It may include the name and location of the women’s embroidery cooperative, photos of women in that group, and a signature of the specific artisan who stitched it, as well as certification as a fair trade item. Call me strange, but I refuse to cut off those tags. Yes, I hand-wash them in a basin of cold water with one hand while holding up the tag with the other. I like to be reminded of the specific individual who toiled for hours on this item. 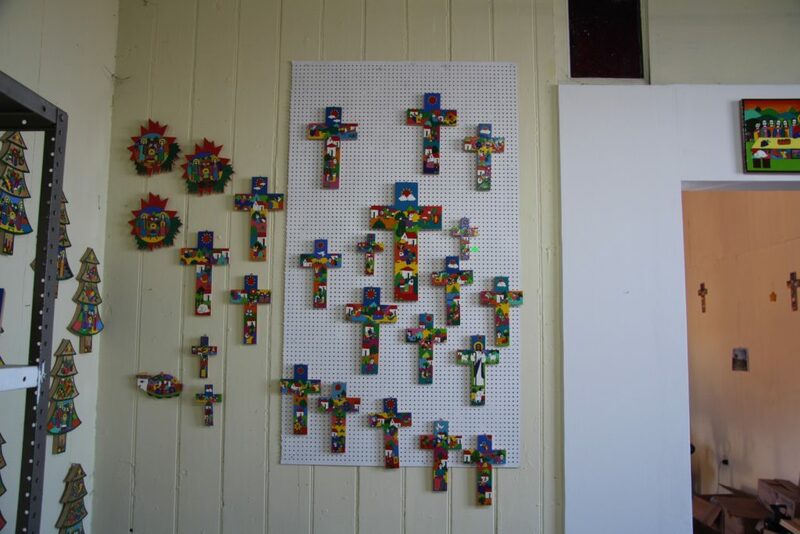 The brightly painted wooden products including crosses are another easily recognized Salvadoran handmade item. One can spot them from quite a distance away. If you are lucky enough to personally know an artist who makes them, like we do, he’ll even add special touches as requested. Speaking of care of these pieces, I have a HUGE tablecloth, 58” x 96” covered with lots of beautiful embroidery. When my sister made a trip to El Salvador, she brought this back for me, and I always used it on the dining room table for show rather than function until recently. I got to thinking how the Salvadoran guesthouses actually use those lovely tablecloths very functionally for three meals a day for countless guests they serve and decided to duplicate their idea. They cover them with a large piece of thick transparent plastic which wipes off with a damp cloth or sponge without risking stains. I discovered the local fabric store sells it in many gauges. By the way, this tablecloth has no tag with all the identifying information I just described so I can machine wash it. My first acquisition of a Salvadoran embroidered piece was a gift from my niece when she visited the country. It is a table runner. I cherish it and ALWAYS have it out. I use it to display Salvadoran things at church from time to time, but I guard it with my life. Countless communities continue to create these lovely pieces. The proceeds from the embroidery cooperative help support an entire community’s care. I, for one, appreciate the arduous work and countless hours that go into making each piece. I hope this art is never lost and that the younger generations will continue to learn the craft that so identifies this culture and country.